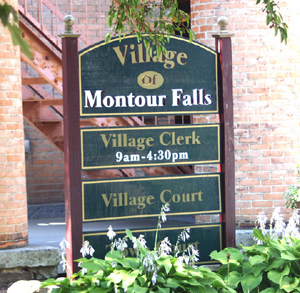 MONTOUR FALLS—The Montour Falls village board approved, Tuesday, July 6, sending zoning law amendments to the village attorney, Robert Halpin. Mayor Donna Kelley said since the law is new, effective Jan. 1 of this year, there will bound to be changes needed. A public hearing is scheduled at the Monday, Aug. 16 meeting for whatever changes Halpin can have written up. Those changes will include a number of amendments Halpin himself found, including spelling mistakes and clarifications. During public comment, the board heard from resident Jody Saunders about another change that may be covered in the public hearing. Saunders and her family were asking if something could be done to the zoning code concerning swimming pools. She explained that the family wants to install a pool, but not where the code says she has to place it. Saunders explained according to the code, it would have to be in the middle of the backyard to account for setbacks from other buildings. She said they want to place the pool in the least used part of the yard, behind the garage, and have it cordoned off by a fence. Saunders added that she runs a day care, and uses part of the backyard for that. She said if it would help, the family will install another fence to cover safety. Saunders explained there aren’t any insurance concerns with having the pool as they planned it. Kelley explained before the new zoning, a pool needed to be 10 feet away from buildings on all sides. As of Jan. 1, that increased to 20 feet. Kelley added there was a dispute between neighbors over the placing of a mailbox. Halpin suggested the board amend the zoning to say mailboxes be placed on a person’s own property, or with the permission of another property owner. Kelley added that the attorney could include how a mailbox is installed. The board discussed how mailboxes have to be at the road, because mail in the village is only delivered by car. • The board approved closing Genesee Street, between West Main and South Streets, for a Corvette club to view the falls. 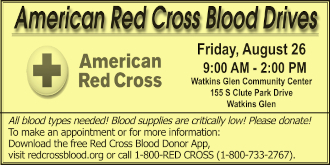 The event is Thursday, July 29 from 9 to 9:30 a.m. Clerk Suzanne Casselberry said there would be about 30 cars in attendance. • Mike Hughey, highway foreman, will replace the basketball hoops at the firemen’s field. Kelley said if there was vandalism again, the hoops would come down. • Trustee John King reported meeting with Randy Deal, Web designer for the village. King said changes to the village Web site would include sections geared towards tourists, pictures, attractions, lodgings, and information on businesses. • The board was asked to look into ways of lowering cable rates at the Montour Falls marina. Kelley said the village is locked into the agreement for this year, but should look into it for next year. • The board tabled discussion on the wastewater treatment plant. • Curbing at Turner Park was discussed. The board talked about not curbing the street. Howell and Hughey will look into it. The next meeting is Monday, Aug. 16 at 7 p.m.